Sol LeWitt (1928–2007), pioneering artist of Minimal art, is also considered, on the basis of his writings, the father of Conceptual art. Both labels might tempt us to view his work in terms of formal reduction and a systematic objectification of the artwork. In fact, however, with his understanding and approach LeWitt created a groundbreaking opening for art in its function and manifestations. The fact that his works furthermore possess vital individual qualities, which clearly elevate them above the principle of the pure variation of neutral basic patterns, was something we experienced enduringly and at first hand in our LeWitt installation in the Hallen für Neue Kunst, which remained in place for over three decades. In 2008 we recorded our impressions in a contribution to the book Sol LeWitt, 100 Views, which was published in 2009 by MASS MoCA in collaboration with Yale University Press. Our text is republished here, complemented by photographs of our 1983—2014 LeWitt installation. 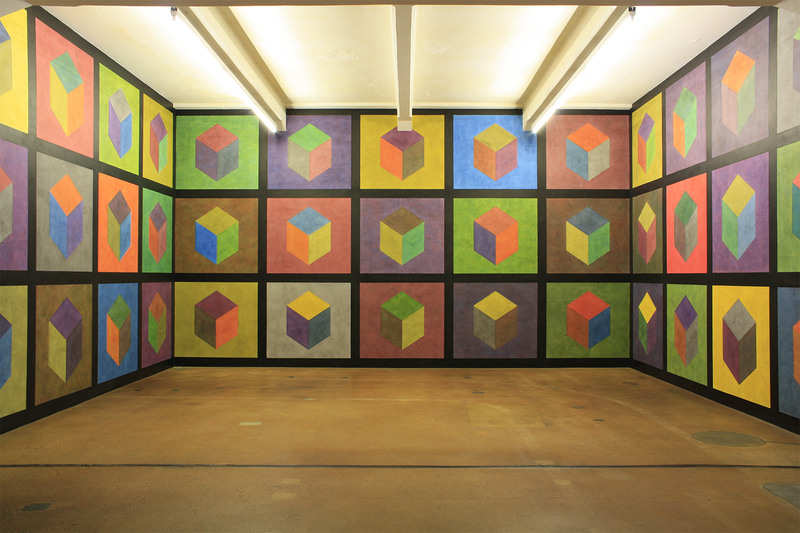 In Schaffhausen we have been privileged to live for the past twenty-five years with an impressive group of works by Sol LeWitt. We are showing sculptures and wall drawings dating from 1967 through the 1990s in a permanent installation and have been delighted to see that the fascination for these works persists despite recent artistic trends and technical innovations. Indeed, as new possibilities for pictorial production have become ever more complex and their usage more prominent, Sol’s works stand apart all the more strongly through their unpretentious presence. Due to the simplicity of their materials and forms, as well as the physical directness of their production, they seem to possess a natural timelessness. It was above all the intelligence of LeWitt’s concepts that originally appealed to us in his artistic approach. Here was someone who finally had disposed of the age-old distance between artwork and viewer in a straightforward way. He placed simple geometric structures directly on the floor and drew lines with a pencil right on the wall. He emphasized the space with clear three-dimensional edges and used the quality of two-dimensionality on planes of all sizes. Over the years we increasingly perceived the complexity of the effects resulting from Sol’s choice of materials, his determination of the works’ dimensions, and their exactly specified execution. We marvel to this day at the fifteen squares of the pencil drawing from 1970: how subtly the gray tones contrast with the white wall, how colorfully the graphite shines in the sunlight against the matte ground, how ingeniously the progressive number of lines affects the impact of the work, and to what degree the skillful execution animates an apparently simple geometric principle. Among the qualities of our installations in Schaffhausen are the number and importance of the works by which each artist is represented. From the very beginning in 1982/83 the presentation of comprehensive groups of works has been intended to enable even inexperienced visitors to gain access to the ideas underlying and shaping the artworks’ character and appearance. Moreover the works at the Hallen für Neue Kunst not only find the space they needed, but also have sufficient time to unfold their impact through a long-term presentation. 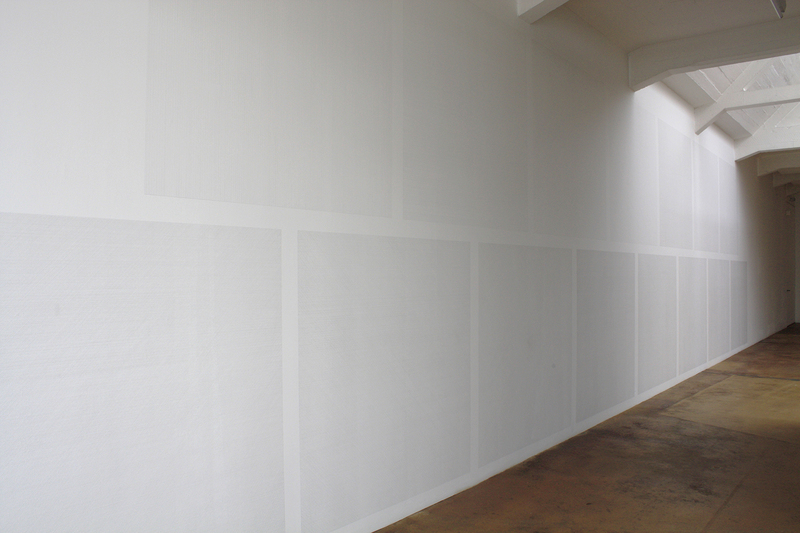 We had determined the selection of Sol LeWitt’s works together with the artist, as we did with others, before building the walls and spaces for their presentation. Since then LeWitt’s works have asserted themselves generously and remarkably serenely in their bright surroundings that overlook the green water of the Rhine flowing past. Even more than the sculptures, the wall drawings at the Hallen für Neue Kunst have proven to be particularly riveting for their physical directness. They offer surprisingly different solutions to the problem of how to convincingly structure essential linear patterns in combination with the primary colors (plus black), and thus constitute a constant visual and intellectual challenge. Viewers move from the early serial pencil drawings, whose almost monkishly disciplined execution makes a strong impression (particularly against the background of the digital techniques available today) to the Isometric Figures (1981), whose strikingly three-dimensional feel is barely understood given the (seeming) simplicity of its construction. 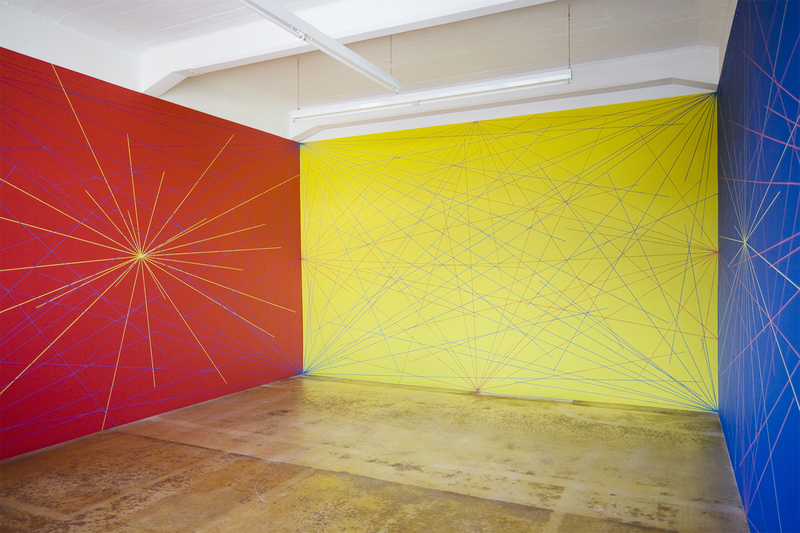 Finally, when visitors arrive in the room with the Three Part Drawing (1978), they are confronted by the explosive energy of its superimposed rays of red, yellow, and blue. The artwork’s intensity becomes physically palpable and thus narrows any intellectual distance the viewers may have in favor of a more emotional appeal. LeWitt repeatedly visited the Hallen für Neue Kunst, at times alone or with his family or assistants. He knew he had the liberty to intervene in and make changes to the existing installation. In 1994 he took the decisive step of designing new works for the group that he in the meantime had come to regard as “classical”. He played with the lateral light source from the large windows, capturing the reflection of the light in wide wall drawings that juxtapose matte and shiny blacks. Like massive clouds, two forms float on the dark background, each the inversion of the other. In addition, LeWitt filled the three sides of a room next to these irregular forms with a colorful cubic pattern of strong three-dimensional effect. Visitors who sit in this room cannot get enough of the diversity and equality of the color tones. As with other works by LeWitt, they try to decipher the guiding logical principle of organization which cannot be found here, because it does not exist. Instead the viewers perceive with rising admiration the process of production that allowed a result of great complexity and power to develop simply through the reduced means LeWitt employed and the precision of the work’s execution. Adding to all these sensations is the impact of the visible absence of any hierarchy. Having no primary or secondary emphases, favored or unprivileged areas, the works of Sol LeWitt are clear statements of a democratic worldview. As such, they are open to all. In order to experience their expressiveness one need possess neither background knowledge nor an ability to discriminate. The works encounter the viewers openly and without reservation but still maintain their unmistakable individuality. The intensity they communicate is already contained in the first idea and ultimately takes form in its execution. That LeWitt involved others in the realization of his works from an early point in his career underscores the intellectual principle of his approach: he qualified authorship (which manifests itself sufficiently in the idea before the execution) to favor the dissemination of knowledge about the procedures of production combined with a disciplined engagement. These are the conditions of a great oeuvre whose vitality is ensured far beyond the artist’s own generation.